As I mentioned in the previous review, we’re always doing the drive between Grantham and Manchester, or from Grantham to Boston, so we’re always looking for new places to eat. 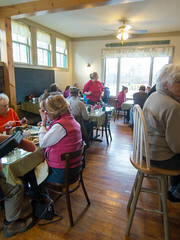 Another place that recently showed up on my radar was the School House Cafe in Warner. 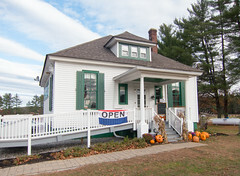 The School House Cafe has been around since August of 2011, when two former waitresses from The Foothills (Warner’s other major breakfast spot) converted the old school house on Route 103 in the Davisville Village part of Warner (Exit 7, for you NH folks) into a catering kitchen, and they converted the rest of the space into a small restaurant that’s open for breakfast and lunch. The result is a menu of “down home” cooking, focusing on omelets, pancakes (big, honking thick plate-size pancakes, like the Foothills), and breakfast combos. It’s also quite popular, with almost a 45 minute wait on a Sunday at 8am. 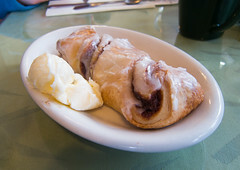 Looking over the menu, we decided to start with a cinnamon twist. I was quite pleased with this: the pastry was light and flaky, the filling nice and cinnamony without being overly sweet, and the entire assembly was nicely toasted up. And, almost as important, this was the right size for a breakfast appetizer: nice, but not filling me up too much before my main course. 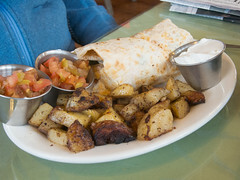 For that main course, Carol opted for the breakfast burrito. Up here in NH, that’s always a bit of a risky call, but they did a rather good job of it at the School House, with a nice layered interior of eggs, veggies, and meat, served up in a toasted tortilla with some pico de gallo. 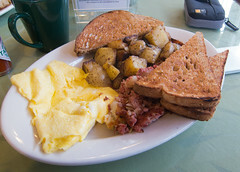 Myself, I opted for the corned beef hash and eggs, and I was pleased as well: the corned beef hash had a nice, rich beefy note to it, and was nicely fried up all most and crispy, but not greasy. The eggs were nicely scrambled as well. The home fries were a pleasant surprise to me: too many places around here undercook homefries, but these were nicely double-cooked: first par-cooked to softness, and then finished on the griddle with a good sear. The result is probably my third favorite homefries in broader area (after the Tumble Inn in Claremont and the Fairlee Diner in VT). Overall, the School House provided a nice staff and a pleasant enough breakfast, and the result is another great breakfast place to work into our rotation as were driving south. One of the more interesting aspects of London is that there are so many good pubs, it can be difficult to experience them all. When we’re visiting London, we’re generally rather spoiled, as my brother and sister-in-law live almost next to the very excellent Cask Pub and Kitchen (which I haven’t reviewed here, since I’ve only ever had bar snacks for food there). The good part of this is that a quality pub with a very good selection of beer is almost always at hand. The down side of this is that I tend to ignore a lot of other good pubs, even ones that are just down the street. One case in point is The Queen’s Arms, which is just down the street from the flat, but until this trip I had only been in there once, and that for a quick pint. Our trip to London, however, was also coincident with my friends Rick and Sarah’s trip to London/Wales/Ireland, and they in particular enjoy getting together with friends from Metafilter (I’m semi-active there as well) for spontaneous meetups. So it was decided that their visit to London was the perfect excuse for a meetup on December 27th. Alas, much of London is shut down around the festive season, with publicans in particular using it as a good opportunity to take a well-earned break from their normal routine. So many of the pubs around Pimlico, including my well-loved Cask, were closed on the 27th. But Queen’s Arms was open, so the meetup was scheduled there instead. I’m rather glad it was, since this finally represented a good opportunity to check out the Queen’s Arms.